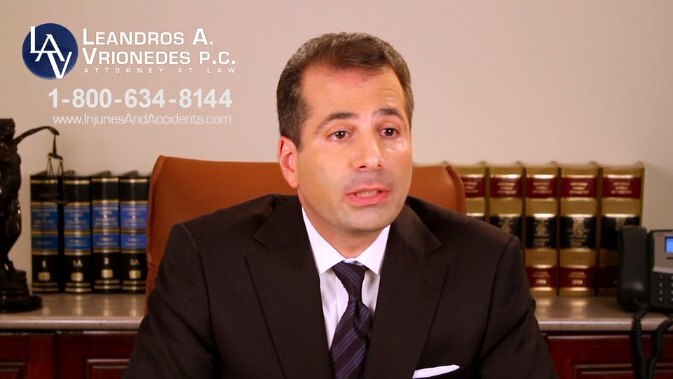 Attorney Leandros Vrionedes: I am Leandros A. Vrionedes. 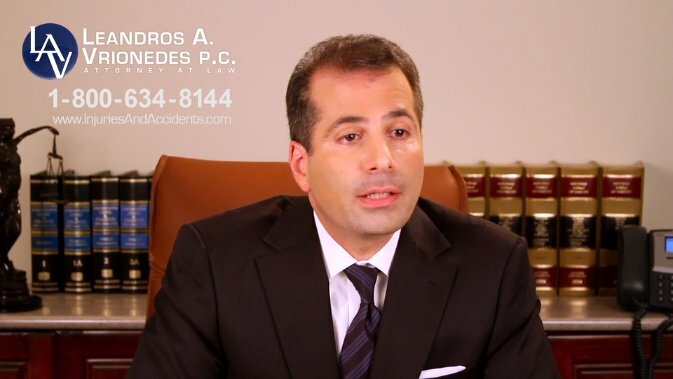 I have a law firm, Leandros A. Vrionedes, P.C., which was started in the year 2000. Prior to that, I was an attorney, and managing attorney at a very prominent personal injury firm. I specialize in personal injury cases. Everything from construction cases, car accidents, slip trip and falls, lead poisoning and excessive force cases and civil rights cases. What differentiates my firm from everyone else is that when you call, you will get me. You will also get your phone calls returned. I strive to give the best representation possible, and that means giving my all to a particular case or client. That would mean, even if I have to put in the hours, whatever it takes: consulting with experts; speaking with other colleagues; taking the case all the way to trial. We do what we can to absolutely make this experience the best possible for a client who has been injured. The first thing I tell anyone who has been injured in an accident is call an attorney. Call an attorney right away. Client: He basically held my hand during the whole case. Any questions I had he answered, any questions I didn’t know I needed to ask, he answered them without me asking. He told me everything that was going on step by step. The length… how long, what can I expect, what I shouldn’t expect, what I shouldn’t anwer. He basically did his job above and beyond. More than I can expect. 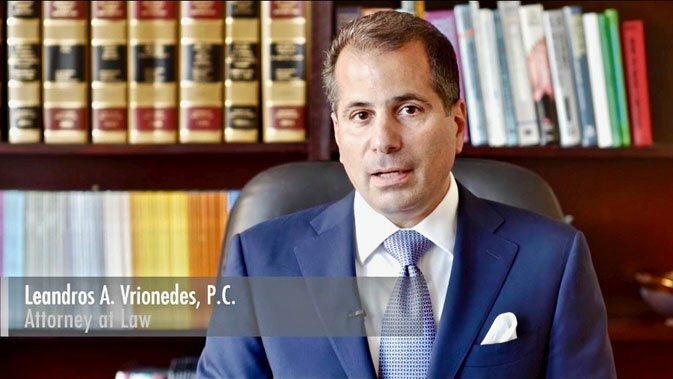 The Law Firm of Leandros A. Vrionedes, P.C. has an established reputation in the New York legal community for successfully representing plaintiffs in personal injury matters. We have obtained significant verdicts and settlements for clients injured in personal injury accidents, car accidents, slip and falls, construction and workplace accidents, medical malpractice, defective products, wrongful death, and municipal liability including police and transit cases. For a detailed discussion of the firm’s areas of expertise, please see the Practice Areas page of our website. Even minor auto and other vehicle accidents can lead to lasting injuries. 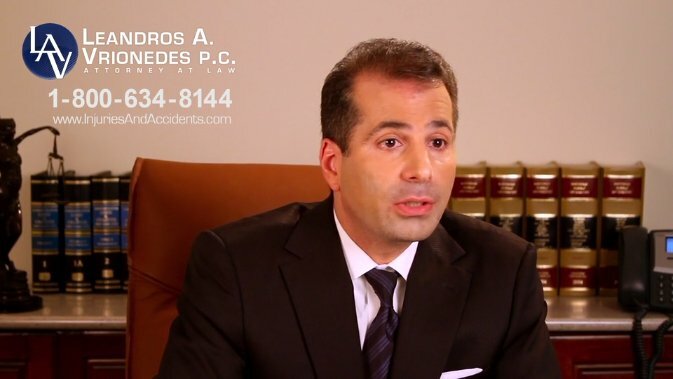 Our firm pursues the compensation clients deserve when an accident was caused by another party. In slip and falls and other premises liability cases, the firm works to hold property owners responsible when careless maintenance and upkeep results in accidents and injuries. Injuries at the workplace can create significant disruption to an injured victim and their families. Our firm will fight to replace financial loss for damages to assist families going through a catastrophic construction site accident or workplace injury. 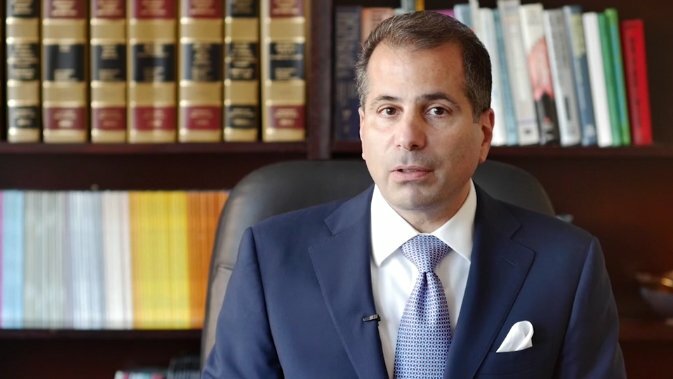 The firm’s experience handling serious injury and wrongful death cases gives clients the advantage of a skilled advocate acting for their best interests. The firm has more than 25 years of civil litigation experience, including extensive proficiency in cases involving catastrophic injuries and wrongful death. Our attorneys are dedicated advocates who zealously represent our clients’ best interests. We value each of our clients and focus on providing individualized attention to every client we represent. Our unwavering commitment to our clients is evidenced by our Client Bill of Rights which sets forth in writing, our dedication and accountability to our clients. The Law Firm of Leandros A. Vrionedes, P.C. emphasizes listening to our clients, determining each client’s goals, and answering any questions that arise. The firm then formulates a legal strategy to meet the client’s objectives. We will not hesitate to aggressively protect a client’s rights and pursue litigation should that prove to be the best way to meet a client’s goals and maximize their recovery. Our attorneys represent clients on a contingency fee arrangement, so there is no fee unless we obtain a settlement or verdict on your behalf. If you have suffered an injury, please contact the Law Firm of Leandros A. Vrionedes, P.C. by email or by phone in the Manhattan area at 212-889-9362 and in the Queens area at 718-777-5895 for a free initial consultation. Some of the important things to remember if you get into a car accident is to notify your insurance company, take photographs at the scene of the accident if you do have a camera. Nowadays, since everyone’s cell phone does have a camera, be sure to take some photographs of the position of the vehicles and the damage to the vehicles before anyone moves them. And also, make sure that you tell your side of the story to the police officer who arrives at the scene. If you are injured on a construction site, New York has special laws that protect you; Labor Law section 200, 240, and 241, depending on your activity. New York Labor Law section 200 is basically a negligence section that applies to construction and demolition sites.You still have to show negligence upon the negligent party, whether it be another contractor, the general contractor, or the owner of the property. Section 240 of the New York State Labor Law puts absolute liability upon the owner of a property to keep a workplace safe. Basically applies to any accident that happens in which it is height related, whether it be on a ladder, a scaffold. As long as it is height related, 240 of the Labor Law puts absolute liability for the safety of workers upon the landlord of the property. Section 241 of the Labor Law puts absolute liability upon the landlord or the general contractor, but you must prove an industrial code violation. Without an industrial code violation, there is no absolute liability, and then you would have to prove negligence and your claim would be under section 200 of the Labor Law. If you get into a car accident, you should contact your insurance company. They provide coverage for you. And in New York State, because it’s a no fault state, they will provide the coverage for your medical bills and your time lost from work. And there’s certain time limitations to file a no fault application. In New York state, that’s 30 days. So yes, you should contact your insurance company. One of the most difficult things to do is to put a value on a case. Each injury is different, each accident is different. The liability situations are very different. The residual effects of the injuries are very different on each individual, and affect people very differently. But what we do look at is any permanent disability, permanent scarring, time out of work, lost wages, whether they be past or future. And then, at some point down the line, we start negotiations with the insurance companies and then try and work out a number that we believe is fair. New York is a no-fault state when it comes to motor vehicle accidents. What that basically means is that if you’re a passenger in a car, or a pedestrian or a bicyclist who gets hit by a car, that vehicle, whether you’re in it or it hits you, that insurance company pays your medical bills and your time lost from work, no matter whose fault the accident is. Now, in order to sue or make a claim against the vehicle that is at fault, you have to reach the no-fault threshold. And the no-fault threshold is basically whether or not you have a serious injury under the law. There are certain categories of serious injury in New York State. A fracture is automatically serious. Significant scarring is automatically serious. Loss of a fetus is automatically serious. And then there’s a couple of categories that get a little tricky. But, in essence, you need some type of permanent partial disability in order to prove a serious injury and then pursue your claim for pain and suffering damages. In order to help you more quickly, please fill out the form below and click submit. By submitting this form I acknowledge that contacting Leandros A. Vrionedes P.C., through this website does not create an attorney-client relationship, and any information I send is not protected by attorney-client privilege.